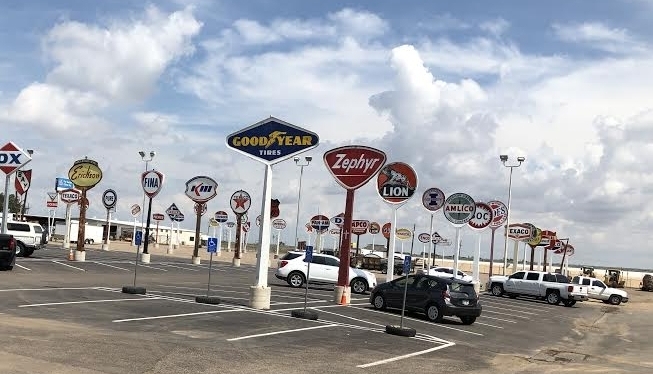 We headed for Lubbock to see my collector friend Rusty Cook that has a huge and incredible collection of signs on poles as well as a huge Events Center (Cooks Garage) and auto restoration shop etc etc. He’s a very creative and ambitious guy as well as a very nice guy. They serve delicious food at his place but since I couldn’t eat I had to pass on the food this time. We then headed off to a little town called Cisco which is down by Fr Worth where I had bought a sign off of Facebook a while back. We loaded that up and headed to Waxahachie where the big load awaited us. We stayed the night in Waxahachie and began loading at about 8:30 am the next morning. Fortunately Scott Green has helpers that made the job of loading the 30 plus signs pretty easy for me. All I had to do was show them which signs went where. I put all the big 6 foot round signs in the truck rack and the ovals on the trailer in a special rack I had designed for this trip to carry the big load I had bought. Yes I bought another sign or two from Scott while I was there, but I also rejected an Amoco I had bought as it was smaller than I had thought it was.